This case report summarizes the treatment of an 8 year-old FS West Highland White Terrier named Darla for pain relief due to muscular tension/trigger points related to suspected beginning stage intervertebral disk disease in the caudal thoracic spine. Treatment consisted of a series of three dry needling treatments with Serin needles (0.16 x 30.0 mm), each 7 days apart. I started the first treatment with relatively few needles and kept adding more points as the treatments progressed. The first treatment did not seem to produce any obvious results; however, after the second treatment, the owner reported marked improvement in activity and comfort level. The owner decided to discontinue the patient’s tramadol (only 2mg/kg BID) as she felt that her pain was well enough controlled. Darla, an 8- year-old FS West Highland White Terrier, was presented to Vet-2-Go on 08/29/17 for decreased activity related to back pain of 3 days duration, as reported by owner. Darla is reported to be reluctant to jump on the couch, bed, up at the owner, and to walk up and down the stairs of the apartment. Darla was adopted by her owners in 2014, and her previous history is unknown. However, she was diagnosed and successfully treated for Leptospirosis October 24, 2016, was hospitalized until November 2, 2016 at Vet-2-Go and has since been on canned Royal Canine k/d and is treated like a chronic kidney disease patient. Blood work was performed at short intervals following her hospitalization initially, then at about 2 month intervals to monitor her chronically mildly elevated BUN and creatinine values, which were likely the result of the acute kidney injury caused from the leptospirosis infection, and are at this point stable. Otherwise, she is doing well at home, and there is no report of any PU/PD, lethargy, vomiting, or any other indications of current kidney failure. She lives a fairly sedentary lifestyle and goes on an approximately 1.5 mile walk every day. On physical exam, Darla was QAR, BCS 7/9, and physical exam was unremarkable (vital signs: T 100.7 F, pulse 100 bpm, respiration 32 bpm). No lameness was noted. No abnormalities were noted on brief neurologic examination. Most notably, deep pain and conscious proprioception were intact in all four limbs. Myofascial palpation revealed trigger points in triceps, bilaterally, as well as trigger points in the cervicothoracic area, and reactivity upon palpation of caudal thoracic and thoracolumbar spine, with taught muscle bands laterally bilaterally. Radiographs were taken of spine, lateral and DV, and mild narrowing of intervertebral disk spaces was observed between T11-T12-T13. No evidence of spondylosis or bridging was visualized, and no other abnormalities were noted. A biochemistry panel was preformed and revealed elevated BUN of 39.1 (normal 9.0-29.0 mg/dl) but creatinine of 1.2 within normal limits (normal 0.4-1.4 mg/dl). For comparison, her previous blood work from June 2017 had shown BUN of 40.4 and Creat of 1.4). Slowly progressive Type 2 disk disease was suspected in Darla, including pain without neurologic deficits. Due to Darla’s medical history (acute kidney injury and chronic mild kidney disease) any sort of NSAIDs were contra-indicated, as I did not want to compromise her renal perfusion. Tramadol alone as a neuromodulator was likely not produce the desired pain control. I did not feel that a muscle relaxant and/or anti-inflammatory dose of steroids such as methocarbamol and prednisone were indicated at the time because her clinical signs were mild to moderate. Surgery was not indicated at the time. While a disk herniation was a risk, and the owners were advised that this could happen, a more integrative approach to her pain was chosen. According to the Compendium of March 2009, “conservative management is usually reserved for cases with recent onset mild myelopathy or paraspinal hyperesthesia.” No ataxia or paresis had been noted on exam. Therefore, I decided that acupuncture as a neuromodulation tool combined with a low dose of tramadol (at 2mg/kg BID – TID) to act centrally as well as rest with controlled, moderate, regular exercise (only 10 minute leashed walk every day, no stair walking, no jumping) may help control Darla’s pain and release some of her hyperesthesia. A weight loss plan was also discussed with the owner, as a leaner body condition score may help in strengthening her abdominal musculature and work more effectively at supporting her spine/counteract her spinal compression. While no advanced imaging techniques, such as MRI, CT, or myelogram were available at the time, a disk protrusion could not be completely ruled out but was highly unlikely due to lack of fitting clinical signs. Similarly, vascular lesions, neoplasms could also not completely ruled out. Based on physical exam findings, blood work, meningitis was unlikely. Pain due to GI was unlikely, but underlying organ system abnormalities may have contributed to her back pain. Radiographs did not show evidence of discospondylitis. 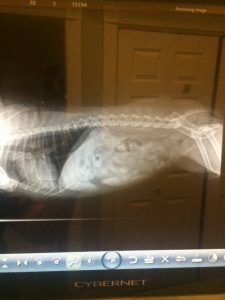 While some of her back pain may be due to underlying kidney disease, based on radiographic findings along with physical exam and most importantly myofascial palpation exam findings, mild thoracolumbar IVDD was suspected as the most suspicious differential. Acupuncture treatments consisted of 3 dry needling sessions, 1 week apart. Week 1: wanted to increase parasympathetic stimulation to create muscle relaxation, then stimulate some relevant spinal nerves as well as touch on some regional tender points but avoid the most tender area itself. While Darla is still at risk for disk herniation in the future, at which time surgical intervention may be chosen, acupuncture treatments have been a reasonable and useful adjunct tool in pain modulation and muscle relaxation at this time and may slow the progression of the suspected IVDD and help provide Darla with a more acceptable comfort level. During the acupuncture therapy, Darla only received 2mg/kg Tramadol as another pain modulator BID-TID, and sometime the owner did not see the need to give these to Darla at all. At this time, one can say that acupuncture along with heat application by owner at home was likely the only pain modulator utilized, relieving her pain via direct and indirect neuromodulation of peripheral and autonomic nervous system, helping relieve muscle tension associated with an imbalance of her nervous system. 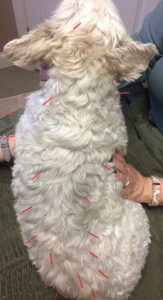 As Dr Robinson explained during the course, acupuncture works by dampening the pain transmission in the nervous system, meaning that not only did acupuncture hopefully help decrease Darla’s pain directly but also influenced Darla’s reaction to painful stimuli. I wasn’t certain about cage rest vs controlled, daily exercise, but Dzierzanowski mentions in Clin Exp Med 2013, 22,3, p. 421-430 (as also noted in Robinson’s CuraCore lecture “Evidence Based Treatments of Spinal Cord Disease) that 2 weeks of daily exercise produce reduced pain, significant improvement in movement range and function in daily activities. Thus, we elected to let Darla have controlled exercise every day vs cage rest, which ay actually be contraindicated, as it decreases perfusion to structures of interest. Darla did not like points distal to her carpus or tarsus, even if they were indicated, so we did not continue with these points. Otherwise, Darla did very well and improved greatly following her second acupuncture treatment, and I hope that we can help her remain in stage 1-2 of IVDD. For now, Darla will be monitored closely and will come back once a month for treatment. In the future, I may consider adding a few kidney points, such as BL 23, 52, GB 25, and others. I would also consider electro acupuncture in this case, but do not own an e-stim unit yet.